Table Mountain Cape Town, spectacular backdrop to the City bowl and world renown icon of the Western Cape, is an inseparable part of Cape Town. Edged by impressive cliffs it rises 1086 metres above sea level with Lion's Head on its west flank and Devil's peak on the east one, it towers as a natural amphitheatre over the City Bowl and Table Bay. Have you ever asked yourself just why it is actually called Table Mountain? Taking a good look at its contours will give you the answer. It has got an uncommon flat top, making it look something like a table from a distance. 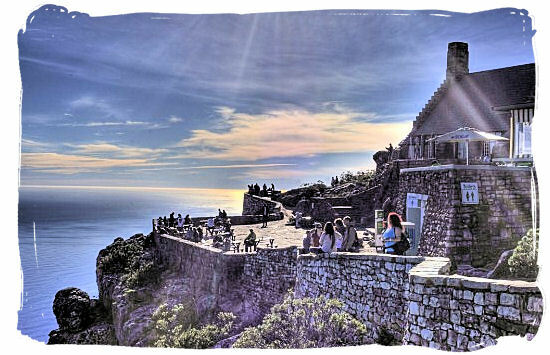 Situated in the most northern region of the Table Mountain National Park, it is part of a chain of mountains stretching from the perimeter of Cape Town right down the length of the Cape Peninsula to Cape Point, a distance of approximately 50 kilometres. Other famous paeks such as Devil's Peak, Lion's Head and Twelve Apostles among others, are also part of the same mountain range. 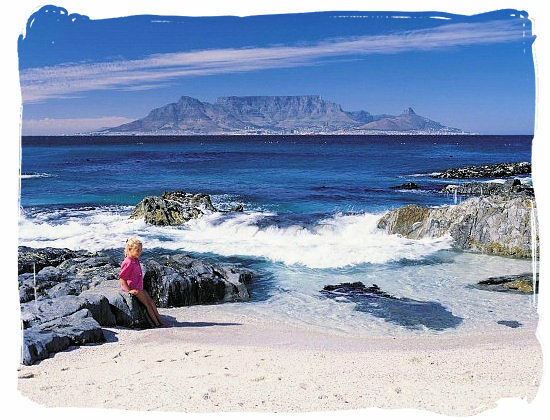 The Table Mountain National Park with its great beaches and dunes, its beautiful valleys and magnificent mountains, covers most of the Peninsula. It is internationally renowned as the habitat of the unique Cape Floral Kingdom world-wide. 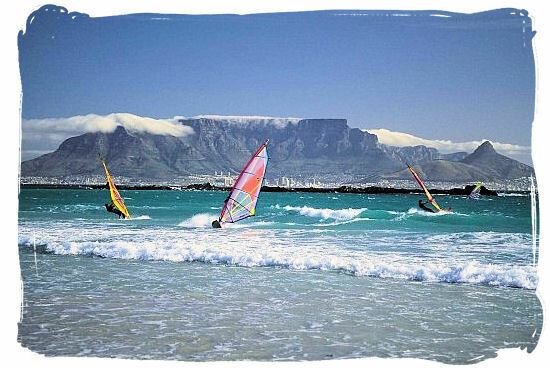 Table Mountain is a world renowned Icon and probably the biggest tourist attraction in the Western Cape Province. 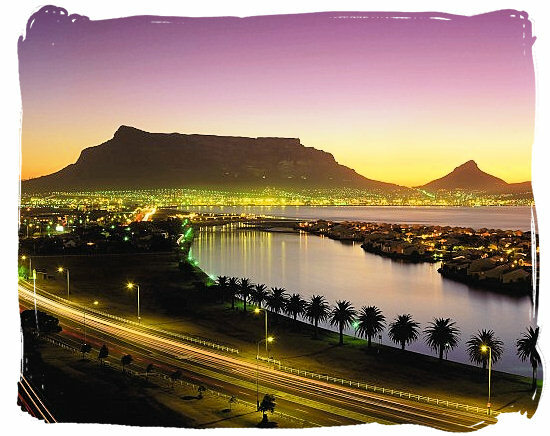 For most visitors arriving in Cape Town, one of the first places to visit is definitely this majestic mountain. Measuring about 3 km from the one end to the other, the mountain's flat surface or "table" is well known for its "Table Cloth". So called by the locals, the phenomenon is in fact a layer of cloud cover that appears over the top of the mountain when the southeaster is blowing. This happens during the summer months when warm air rises behind the mountain and condenses into clouds on the surface of the Mountain's top. A trip up Table Mountain, one of the most amazing natural settings in South Africa, will be rewarded with breathtaking views of Cape Town with its gorgeous beaches and the two oceans. Next to its aesthetic appeal the Mountain is home to a rich and diverse flora and fauna and is one of the most concentrated areas of biodiversity in the world. One of the most well-know vegetation types on the Mountain is the "fijnbos" which is part of the Cape Floral Kingdom and which includes the glorious Protea. The King Protea (Protea Cynaroides) is in fact South Africa's national flower. There are plenty of ways to get to the top of Table Mountain. Whether it is by cable car for those who just want to enjoy the sightseeing, on foot, or by mountain bike for the fit and fearless, there is a route to the top for everyone. 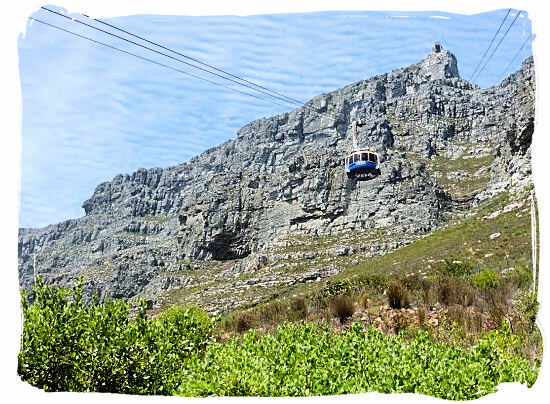 The easiest way to reach the top is by Cable Car, which really is a thrilling ride as you see Cape Town slowly drop away beneath you, while the cable car's rotating floor gives you a 360 degrees aerial view of the city. You can also opt for hiking and explore the mountain range with friends. Once on its 3 km wide and flat top, you can stroll along its paths, enjoy the viewing platforms, soak up the panorama and come to rest at the restaurant and cocktail bar.